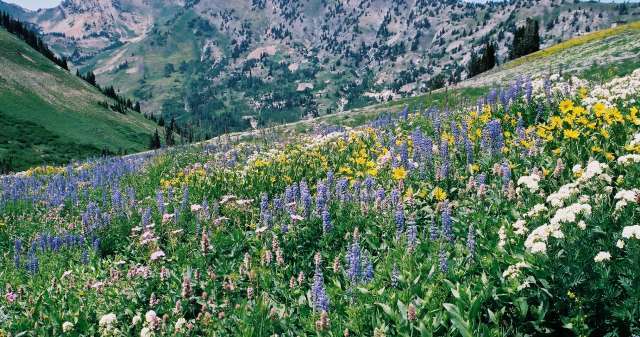 "Stunning, vibrant, and off the rails," are a few of the terms I&apos;ve heard used to describe the summer wildflower season in the Wasatch Mountain Range this year. One of the most spectacular displays took place in the Albion Basin located in the Alta Ski Area on the slopes where skiers frolic throughout winter. The wildflower season in the Wasatch peaks from around mid-July to the first week of August, and I highly recommend making a trip to witness the display. Of course, we are talking about nature here, so the timing could vary. I visited around the third week of July. Arriving just before sunset, I was able to capture lovely long shadows and warm light. As the sun dipped below the horizon, the colors shifted toward blues and oranges. It wasn&apos;t an overly dramatic sunset, which was ideal because the wildflowers were the true stars anyhow.